It might seem that geography would have no bearing on the trials of childhood and the universally experienced journey through puberty but this isn’t true. For some it might be a case of cultural traditions that make all the difference, for others it really is a result of the environment in which they live in that influence show this rocky path is navigated. For best friends Thor (Baldur Einarsson) and Kristján (Blær Hinriksson), their lives in a remote fishing village in Iceland consist of being bored and catching fish. There are girls, like Beta (Dilja Valsdotttir) and Hanna (Katla Njalsdottir) but any interest in the opposite gender is currently at a nascent stage, though in Thor’s case, he might be put off by his bullying older sisters Rakel (Jonina Thordis Karlsdottir) and Hafdis (Ran Ragnarsdottir). With his divorced mother Hulda (Nina Dogg Filippusdottir) rejoining the dating scene to the disapproval of her children, Thor is missing a male influence in his life; Kristján fares little better with his life being made unbearable by his drunkard father Sigurður (Sveinn Ólafur Gunnarsson). Yet, as the two friends eventually make feeble attempts to embrace their rampant hormones, Kristján’s affection might be aimed elsewhere. 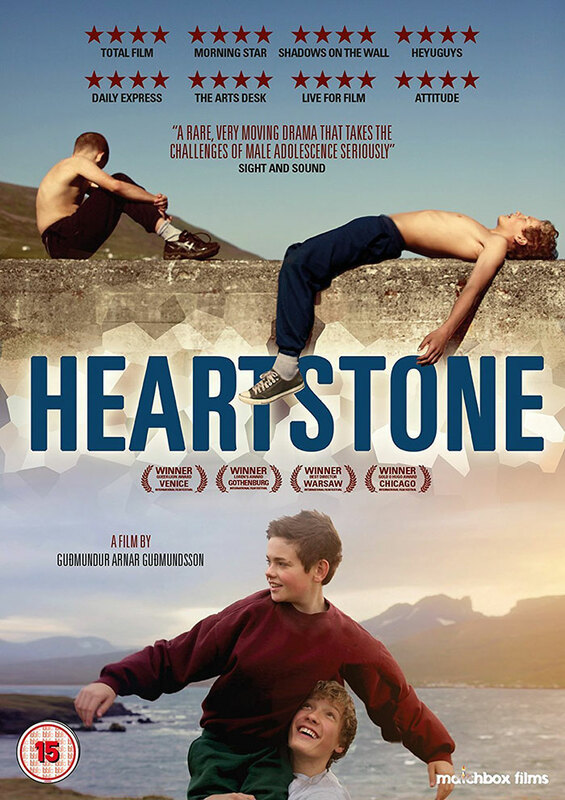 Guðmundur Arnar Guðmundsson’s feature debut Heartstone is a coming-of-age tale that follows the blueprint written by numerous predecessors yet manages to offer something unique through its austere location. Certainly, the vagaries of youth as presented here will be recognisable on a global scale but the bleakness of the hermetic existence the protagonists provides the vitality and eye-opening interest of this outing. The time frame isn’t established at any point – the absence of computers, mobile phones and other modern technology either dates this to the pre-1990’s or is a reflection on how isolated this village is from civilisation. This helps streamline the narrative in portraying the ennui endured by the kids and how their bucolic existence informs their ignorance in the way of the world. Unfortunately, the lack of viable entertainment means the kids resort to primal and often barbaric ways to quell their boredom, as the opening scene of a fish violently beheaded then stamped on attests. Not the last example of animal cruelty, this adds little to the film, yet frames our understanding of their behaviour by delineating the shortcomings of an unsophisticated community. Many of the favoured genre beats – single mother, abusive father, testosterone fuelled peer pressure – provide a familiar background onto which Guðmundsson paints a series of vignettes that could easily have come from the pen of Mike Leigh or Shane Meadows, such is the naturalistic way the bumbling antics of youth are conveyed. Always at the mercy of his sisters’ teasing, Thor is the nominal whipping boy of the first half, from being locked out of the house naked to wetting the bed during a sleep over and fleeing in embarrassment. Thor is the smaller of the two friends, less developed physically, sexually, and in maturity, thus feels inferior to taller, deeper voiced, better looking Kristján. It doesn’t stop Beta from liking Thor which leaves Kristján and Hanna to pair off in a natural completion of the friendship circle – except Hanna isn’t quite as ready and Kristján’s feelings lean more towards Thor than Hanna. The turmoil in Kristján’s head from having an alpha male father, the pervasive homophobia in the village, and sharp rejection from Thor, is unlikely to be resolved without tragic consequence. This might sound like Guðmundsson has been lazy with his characterisations but in fact, the devil is in the detail. Thor’s sisters are different from each other; Rakel is aggressive, volatile, and selfish whilst Hafdis is quieter, more caring and artistic. She has Thor and Kristján made up and pose in a semi naked embrace for her; unfortunately, the painting is found and the boys’ are publicly humiliated, yet she sees beauty in love in all forms. But the grey and dank surroundings of the village are hardly becoming as a fertile base for love to bloom regardless of gender, the only thing likely to be cultivated is despair. By telling the story through the point of view of a pubescent teen, we wonder if there isn’t an autobiographical foundation to this story for Guðmundsson, although nothing is confirmed, inferred by the immaculate attention to detail to the nuances in the way the kids react, interact, and behave. Like any great neo-realist film, the younger cast are first timers and Guðmundsson takes their callow, untainted innocence and enthusiasm, and moulds it into their characters, all of whom are utterly compelling. It is ironic with Thor being the most immature that Baldur Einarsson’s essaying of his tumultuous arc is the most mature, not to undermine the subtlety of Blær Hinriksson’s performance as Kristján, highlighted by a painful solo scene as his inner conflict becomes too much to bear. However, this poses the questions whether Guðmundsson chose the right boy to focus on, given the suffering is mostly on Kristján. Should his struggle as the confused one not have been the arc to follow since it is the one in need of a proper resolution? We may never know but this again, this is not a slight against Thor’s tribulations – after all, his feelings aren’t clear either. This is an issue where subjectivity takes precedence and likely a small cavil, along with the overlong run time which exposes a lack of discipline in script editing, in what is otherwise a sturdy slice-of-life yarn that handles the ebbs and flows of the complexities of early teen angst. The emotional attachment tends to waver as the characters inability to express themselves openly puts distance between each other and the audience but the performances compensate for this. For his first feature, Guðmundsson can feel proud of Heartstone, and if he can continue to harness the same unfiltered naturalism in his future works but with a tighter script, he will be a major voice in world cinema.